McALLEN — The pressure was on Tani Talamantez from the beginning. Talamantez’s senior season was undoubtedly her best. She led the upper Valley in scoring (20.9 points per game), while averaging 2.7 rebounds, 3.5 assists and 4.1 steals per game. 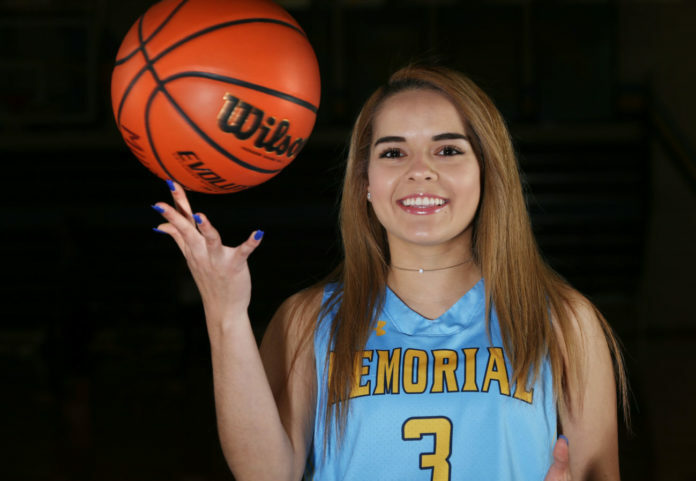 Talamantez was selected as The Monitor’s 2018-19 All-Area Girls Basketball Player of the Year. The Player of the Year honor isn’t the only recognition she received since the end of the season. The Texas Girls Coaches Association handpicked Talamantez onto its Class 6A All-State team. TGCA’s All-State team is comprised of the top 40 Class 6A players in Texas. Talamantez was one of three Valley ballplayers to crack the All-State team’s top 40. Edinburg High’s Jenessah Santa Maria and Brownsville Hanna’s Mia Paz were the other two. McAllen Memorial’s season ended with a heartbreaking 62-58 first-round loss to Laredo United South, but it was nonetheless a memorable year. District 30-6A lost La Joya Palmview, a playoff team in 2017-18, and gained PSJA North and PSJA High, two eventual playoff teams in 2018-19. The new competition did not deter the Mustangs, who ripped through district play with a perfect 14-0 record while winning games by an average of 51.5 points. Over Talamantez’s past three seasons, the Mustangs won 37 of 38 district games. The last district loss Talamantez witnessed came against cross-town rival McAllen High, a 64-53 defeat Jan. 31, 2017. The Mustangs’ loss to Laredo United South also marked the final time Talamantez will share a high school court with sister and sophomore guard Cori Talamantez. Arredondo appreciated her 5-foot-4 guard’s insistence on being herself on the court.